How are Industrial Hot Box Aluminum Enclosures Made? It is important to know what goes into making a product, where it comes from, and what makes it the right choice. This is especially true when a product is part of the protection of your drinking water. 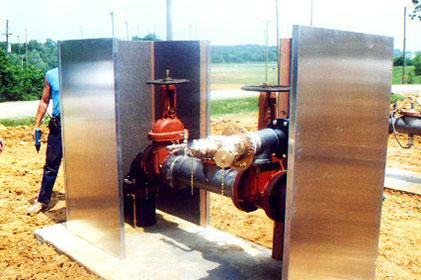 We’re often asked about the design and construction of a Safe-T-Cover protective and backflow preventer covers. These questions typically come from design engineers, municipal water systems, and contractors. This post answers many of those questions. Safe-T-Cover uses marine grade aluminum, a high quality metal that will typically outlast the equipment it is covering. Our enclosures come in four standard colors at the base price. 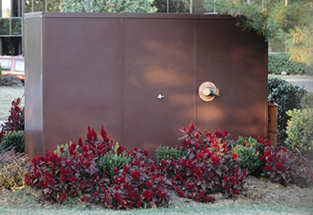 Check our enclosures page to find a full list of 20 more colors that are available for a small additional cost. Being able to choose the right color can often satisfy an owner’s objection to a big shiny box! Safe-T-Cover uses an interlocking-panel design which allows the flexibility to build large custom size enclosures. We have more than 20 standard sizes to choose from. If none of those will fit quite right, our panel design makes it easy for us to build one that will cover your exact needs. Send us your size requirements, and we will work with you to come up with the perfect design. The panel design also packs flat which lowers the shipping cost when compared to other leading manufacturer’s products, especially for fiberglass enclosures. Safe-T-Cover enclosures are also designed to meet ASSE 1060’s structural strength requirements and can therefore handle a vertical load of 100 pounds per square foot. There are Safe-T-Cover enclosures from coast to coast. Most of those we sold in our first year, 1988, are still in service today. How long do they last? More than 28 years (and counting...)! Each enclosure comes with a hardware kit providing the required anchoring bolts and brackets to meet the design requirements. All you need is a screw gun and adjustable wrench, everything else is included in the assembly packet. These aluminum enclosures are as rugged and durable as a building constructed from bricks and mortar – but cost less and are significantly easier to buy and install. You can even watch a video showing two guys putting one together in real time. Spoiler alert: It takes them less than four minutes to put the panels together. Each side panel has 1½” of polyiso insulation cut to the exact dimensions of the panel. This material is commonly used in the roofing industry and is superior to the sprayed-on insulation typically used on a HotBox or BF Products fiberglass enclosure. The R-value for polyisocyanurate insulation is the highest for rigid-board insulation at an average of 6.5 per inch. By using such a high quality material,, the enclosures more than meet ASSE 1060’s requirement for insulation. Many of our most commonly asked questions are about climate control. How does the enclosure provide heat or cooling? Safe-T-Cover has a patented slab mounted heater that heats both the equipment inside as well as the riser pipes beneath the slab. It bolts to the concrete slab and is thermostatically controlled. The heater is designed to withstand water spray inside the enclosure. It has been certified to meet section 49 of UL-2021 for damp or wet conditions. Our heated enclosures are ASSE 1060 Class 1 approved. This means the enclosure will maintain 40 degrees Fahrenheit even when temperatures are as low as negative 30 degrees Fahrenheit. For the other side of the temperature spectrum, air conditioning can be offered if required. Louvers and forced air fans can be provided for applications including pump covers, booster pump covers, air compressor covers, and fire pump covers. This is what a Safe-T-Cover hot box aluminum enclosure is made of. If you still have any questions regarding our enclosures, please call 1-800-245-6333 or contact us. To continue learning about back flow prevention and protective enclosures and the rest of your water system, follow us on Facebook or LinkedIn.